← The Pig Ate The Baby! The next Get Out & Write! 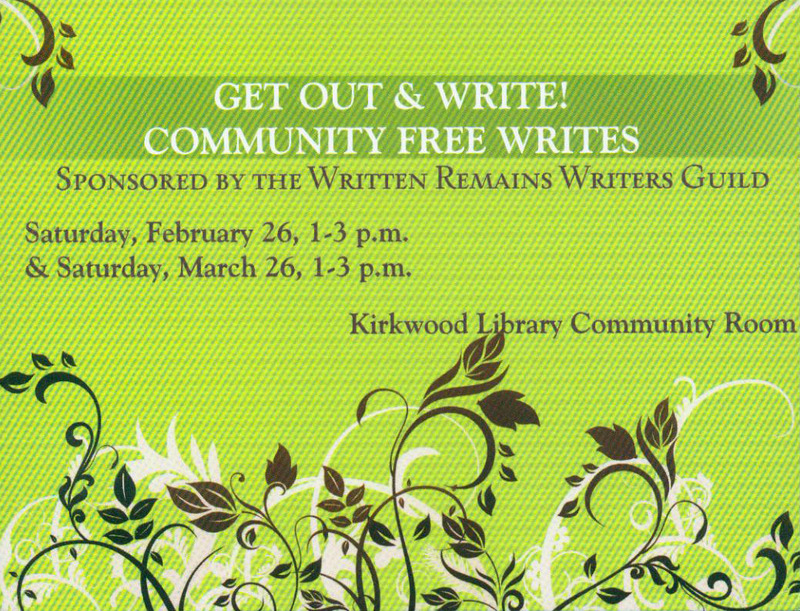 Community Free Write will be on Saturday, March 26, 1 – 3 p.m., in the Kirkwood Library Community Room. All free writes are open to writers at all levels of experience. No RSVP is necessary, and all you need to bring is a willingness to write, and your writing tools: pen and paper, laptop, quill and scroll, papyrus, crayons, marble stone and chisel…. The Free Write sessions are a combination of private writing time and shared activities. Last month, the group did three writing prompts. Some people shared their efforts, some didn’t. The prompts and sharing are optional. We plan to hold Free Writes on the 4th Saturday of each month, same time, same place. Please join us!